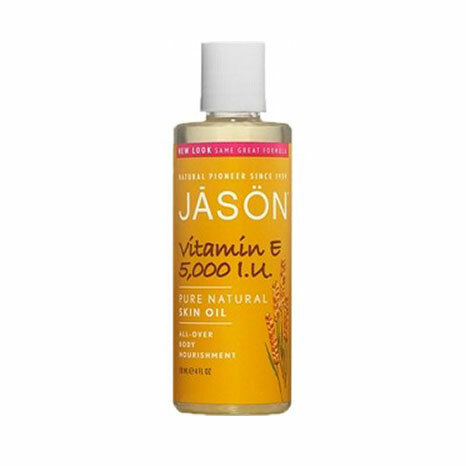 Jason Vitamin E Oil 45,000 IU is a maximum strength topical treatment that combines vitamin E oil with 7 other natural oils. Use daily to help reduce scars and the appearance of fine lines and wrinkles. Gently massage a small amount on face, body and hands 1-2 x daily. For external use only. Keep out of reach of children. Avoid direct contact with eyes. If rash or irritation occurs, stop use. Ingredients: Tocopheryl acetate, Helianthus annuus (Sunflower) seed oil*, Carthamus tinctorius (Safflower) seed oil*, Borago officinalis (Borage) seed oil, Camellia sinensis (Green tea) leaf oil, Macadamia ternifolia seed oil, Oenothera biennis (Evening primrose) oil, Ribes nigrum (Black currant) seed oil.